With a voice that floats with soulful warmth and honesty, Rick Hart is a storyteller, whose words and melodies weave through all the dynamics and extremes of human emotions and relationships. A tapestry of melody soaked simplicity and thoughtful imagery, influenced by the likes of Kris Kristofferson, George Jones, Rolling Stones, Springsteen and Tom Petty. This multi award winning songwriter (2014 Songwriter of the Year, Australian Songwriters Association awards), seamlessly blends ingredients from country, soul, blues, rock’n’roll and folk to create a sound all his own. For The Country Record said “Hart is a refreshing counterpart to the plethora of male singers who have gone awry of country tradition. Hart is a perfect antidote to whatever bro-hangover still looms over us and has the same refreshing appeal that Sam Outlaw’s debut album”. 2017 and 2018 has seen Hart playing alongside the likes Bill Chambers and Things Of Stone & Wood. 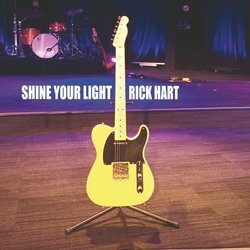 Shine Your Light was written by Rick as a tribute to his good friend and guitarist Tom Fauvette, who passed away suddenly in late April 2018.